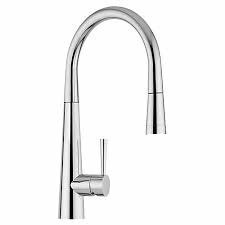 The Premier Celica Arch kitchen pull out tap has a modern look and is a stylish addition to your home. It is chrome plated and made from solid brass and comes with a warranty of 5 years. The beauty of kitchen pull out taps is that they make the day to day task of keeping your kitchen sink area thoroughly clean much easier by using the pull out hose and spraying the entire sink area plus when prepping vegetables it’s so much easier to give them a thorough hose to get them clean. This pull out tap comes with ceramic discs to prevent annoying dripping.